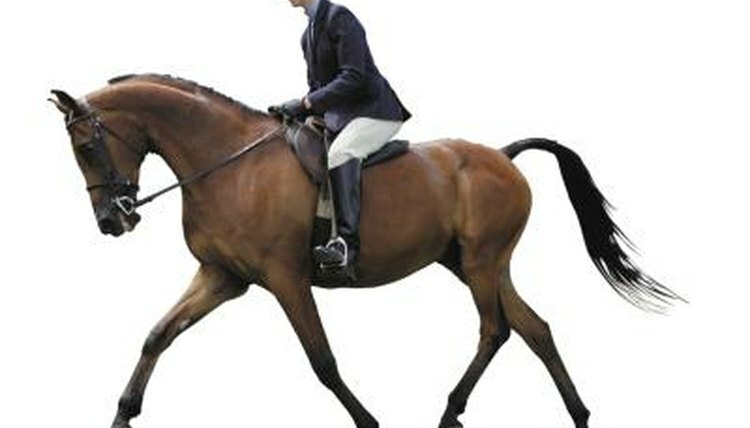 A horse with a weak hind end cannot collect himself properly and will often appear underdeveloped on the rear in comparison to the heavily developed front end. Unless the problem is corrected, it becomes increasingly worse over time. If your horse has a weak rear end, he will be unable to extend his stride properly and may have a difficult time executing maneuvers that should not be all that complicated. Weakness can be caused by a lack of proper training, conformational problems, a lack of muscle development, or joint and bone problems. If you notice your horse is weak in the hind end, you need to have him checked by the veterinarian to determine if a medical problem is the cause. Degenerative bone problems, injuries and a variety of other health problems can make it painful for a horse to use his rear end and hind legs. Once your veterinarian has ruled out medical problems as a cause, you can start working on retraining your horse to balance himself more properly and work off his hind end. Strengthening exercises, such as trotting in circles and up hills, help your horse learn to use his hind end and gradually build up muscle tone. Practice asking your horse to make transitions between gaits frequently, and work on teaching him to both lengthen and shorten his stride on command. Ground poles, small cross rail jumps and backing exercises can also be helpful. Vary exercises so your horse does not get bored. Equine protozoal myeloencephalitis, commonly referred to as EPM, is a disease that can manifest as weakness in the rear end of the horse. Your horse may have EPM if you notice weakness combined with a lack of coordination, lameness, difficulty traveling on slopes, muscle atrophy, paralysis or seizures. EPM is caused by parasites and can be treated. The American Society of Equine Practitioners notes that symptoms of EPM can be significantly improved or even completely reversed in 60 to 70 percent of horses if affected animals receive aggressive veterinary treatment. If the weakness in your horse's rear end develops suddenly or occurs with other symptoms, call your veterinarian immediately so that your horse can be tested. A combination of medical and chiropractic work, training and strengthening improves the weak hind end of most horses. With that said, some horses will simply never have the ability to completely overcome their weak hind ends. If your horse does not have the conformation or ability to collect himself properly or propel himself quickly using the hind end, then you need to tailor his job to suit him. Unless there is a medical reason why they cannot be ridden, horses with weak hind ends are best suited for lower level flat work and light trail riding.